How many hours have you spend trying to clean that stubborn stain from your favorite carpet? 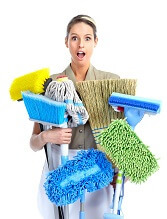 Are you tired of having to clean your house for hours only so you won`t see any great difference at the end? None of these has to happen! Put the vacuum cleaner SW11, the dust brush and all the products used for cleaning away and call some Balham cleaners. If you live in SW12 postcode area, our cleaning company can help you have a fresh home or office on a regular basis. No sweat, stress and wasted time anymore. All you have to do is contact our office on 020 3397 9868 and tell us what you need. Most people never realize how much they need professional help; they think that spending hours of cleaning the house or their office on a regular basis can be compared with the work that Cleaners Balham do. Unfortunately, that is not true: no matter how many hours you will spend trying to remove stains and dust, kill bacteria using all sorts of products that you`ve seen on TV or your neighbor recommended you , the results will never be so good as when you hire professionals. The explanation to this is very simple, we know what to use, when to use it and more important how. In the services that Cleaning Company Balham provides, the staff knows exactly what kind of products to use according to the surfaces that need to be cleaned. Our extensive experience when it comes to this field allows us to provide high quality services at an affordable price. You don’t have to worry about your home of office being clean, because you will know that someone will take care of that on a regular basis. Also, you will be able to relax during the process without any stress or concerns for your daily schedule being affected. Our company will bring all the equipments and products needed, therefore you or the company you work for won`t have to invest money in this. You might believe that cleaning by yourself is cheaper, but in fact is not: just think of how many different types of products you will need in order to freshen up everything, materials that you might have never used and if applied wrongly they could damage the surfaces. Professional companies that work in this field are always up-to-date with the newest and best type of methods of cleaning and products. We don’t know all of these because we saw a commercial on TV or some relative recommended them to us; our knowledge is based on years of experience and research in this field. Our Cleaning Services Balham is flexible when it comes to everything: the materials for cleaning which, if you have any preferences, can leave for us to use; the time because it doesn’t matter whether you have time for this process or not, we do and the money, of course. It will cost you less than if you do it yourself also taking to the quality of the work into consideration. This doesn’t mean you are not able to clean your house or office properly, it means that sometimes, there are stains, pets` hair or smells that you might not localize. Your health won`t be affected in any way. We say this because there are some supplies which are used for cleaning and if not careful, they can cause dizziness, headaches, skin burns, irritations, affect pregnant women, etc. We will make sure that none of the materials we use are toxic for you, your family or your colleagues. You will also have more time for yourself, your family and friends. Due to the fact that you won`t spend hours trying to make your home spotless, you will be able to enjoy more free time and relax with the people you love. With House Cleaning Balham you will be able to do everything you want without being worried that you won`t have time for cleaning the house. We also offer insurance for your belongings during the process of SW12 cleaning so you won`t have to worry about any damages or loss of your belongings. This will offer you more peace of mind and you will be able to take care of your daily tasks knowing that all your goods will not only be clean, but also safe with us. Balham, one of the centers of the community in London since World War II, is a neighborhood in the London Borough of Wandsworth, which was in the past a village and a part of Streatham and Battersea. Nowadays, the neighborhood is a place with bars, restaurants, shops, a railway and tube stations, where a cultural mosaic has been created throughout the years. Polish, Somali, Pakistani, Brazilian communities are now well represented in the many wards making up modern Balham. This area holds an annual food festival which first took place from 10 to 14 of July 2011 and featured a wide range of events including restaurant taster menus, Jamaican cookery demonstrations and a hog roast. Cleaners Balham offers great priced SW11 cleaning services including home, office, upholstery and end of tenancy services. You won’t have to stress, worry or work all day trying to make your home fresh and dust free, we will do that, while you can relax, enjoy the company of your friends or simply go to work. Our trained staff and extensive experience in the field make us the perfect choice for your SW12 cleaning. If you want a flexible, trustworthy and cheap company that offers high quality service, call us on 020 3397 9868 for your free quote today. Cleaning has never been this easy as with us. Description: Our SW12 cleaners in Balham are professional enough to handle domestic cleaning SW12, commercial cleaning Balham, end of tenancy cleaning in SW11 or else.